[127 Pages Report] The cloud discovery market was valued at USD 635.8 million in 2017 and projected to reach USD 1,564.1 million, growing at a Compound Annual Growth Rate (CAGR) of 16.4% during the forecast period. The base year considered for this study is 2017, and the forecast period is 2018–2023. Organizations are increasingly adopting multiple cloud platforms to support their varied infrastructure and application needs. The multi-cloud environment provides flexibility to enterprises and enables them to manage various cloud services, such as Software-as-a-Service (SaaS), Infrastructure-as-a-Service (IaaS), and Platform-as-a-Service (PaaS). The rising need for different applications is driving the adoption of multi-cloud among end-users. Multi-cloud is a complex solution, where multiple clouds from different providers are used for separate tasks. With the increasing popularity of multi-cloud, IT administration needs to focus on how to keep track of all SaaS applications used by their employees in different clouds. Multi-cloud discovery solutions play a critical role in providing accurate information on Configuration Items (CI) and relationships, identifying applications that may be at risk, and ensuring monitoring of entire multi-cloud environments to implement the enterprise cloud strategy. The cloud discovery ecosystem comprises application discovery and infrastructure discovery providers, such as BMC Software (US), ServiceNow (US), Puppet (US), CipherCloud (US), Zscaler (US), Cisco Systems (US), McAfee (US), Qualys (US), ASG Technologies (US), and NetSkope (US). The other stakeholders of the cloud discovery market include Cloud Service Providers (CSPs), cybersecurity vendors, managed security service providers, and system integrators. In October 2017, Puppet introduced Puppet Discovery, a standalone product, for the discovery of the hybrid infrastructure to manage it with automation. This intuitive solution enables companies to know what they have in the hybrid IT infrastructure. In April 2018, CipherCloud announced the introduction of CASB+ platform, which enables enterprises to accelerate cloud adoption and ensure their sensitive data is always secured. What are the industries which the Cloud Discovery companies are exploring? 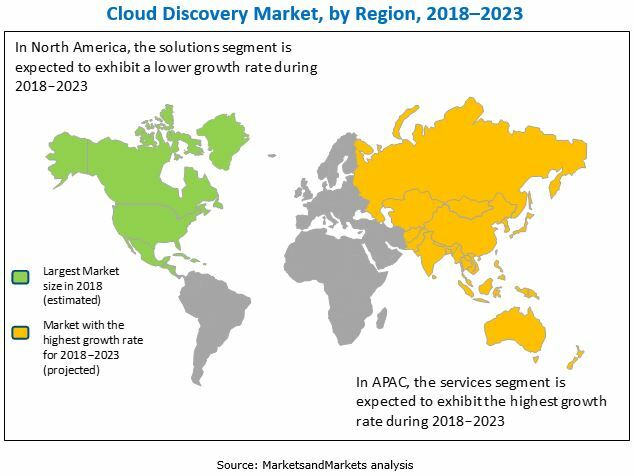 The cloud discovery market is expected to grow from USD 730.8 million in 2018 to USD 1,564.1 million by 2023, at a Compound Annual Growth Rate (CAGR) of 16.4% during the forecast period. The demand for cloud discovery solution and services is expected to be driven by several factors, such as applications running in the dynamic Information Technology (IT) environment, growing adoption of multi-cloud environment, and increasing need to efficiently manage the security of IT infrastructure. The cloud discovery market has been segmented on the basis of components, organization size, verticals, and regions. The services segment is expected to grow at a higher CAGR during the forecast period, and the solutions segment is estimated to account for a larger market size in 2018 in the global market. The adoption of cloud discovery solutions and services among the Small and Medium-sized Enterprises (SMEs) has become a central part of the business process, due to the ease of use and flexibility offered by them. The application discovery solution is estimated to account for the largest market size in 2018. It helps IT administrators to identify any unwanted/unverified cloud application running or residing in an enterprise network. With this solution, IT administrators can get information about the number of users accessing an application, calculate the volume of data traffic, and integrate these applications easily to enable SSO and user management. The enterprises adopting cloud discovery are increasingly inclined toward deploying application discovery solutions to run their critical business functions. North America is estimated to account for the largest market size in 2018, whereas the Asia Pacific (APAC) region is projected to grow at the highest CAGR during the forecast period in the global market. An increasing need for efficient computing framework and complete security while operating in physical, virtual, or cloud environments are expected to drive the global cloud discovery market. The cloud discovery solution provides a comprehensive view of all the applications and IT infrastructure resources used within an enterprise. With the exponential growth of cloud-based technologies, a large number of companies have adopted cloud services on a day-to-day basis to get their jobs done, thereby creating a pool of IT resources, which becomes unmanageable for IT administrators. Therefore, with the adoption of the cloud discovery solution, IT operators can easily manage this pool of IT resources and control the data being shared internally and externally. An advanced IT infrastructure always needs better management of resources to optimize operations, which results in opportunities for cloud discovery service providers. The benefits of cloud discovery solutions are becoming more evident with the increasing number of companies adopting IT resources in various business functions. 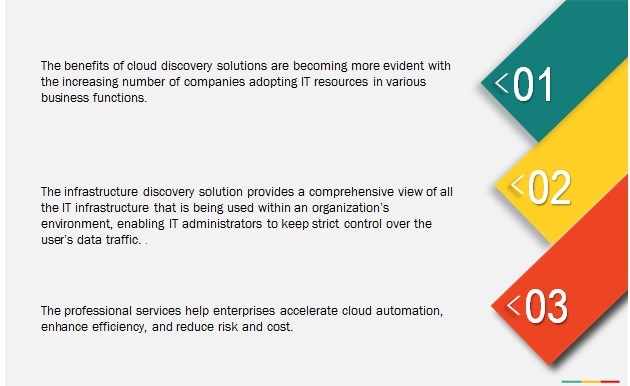 Cloud discovery solutions have been segmented on basis of application discovery and infrastructure discovery. MSPs offer remote management and monitoring of end-users’ IT infrastructure under a subscription model. MSPs are defined as third-party IT service providers that remotely manage customers’ IT infrastructure and systems. MSPs deliver technologically advanced offerings to their clients to provide the best-in-class services. MSPs provide their offerings under a Service-Level Agreement (SLA), which defines the term, type, and quality of service offered to the clients. Enterprises opt for MSPs to overcome the challenges of budget constraints and technical expertise, as they have specialized human resources, infrastructure, and industry certifications. MSPs offer cloud discovery services to help organizations offload the burden of identifying and classifying unmanaged IT resources and cloud applications used within an enterprise. These services are designed to provide technical support round-the-clock, maximize the overall performance, and achieve cost optimization. What are the upcoming industry applications for cloud discovery? Data rules and regulations are in place with an intent to make data more secure. In order to follow strict industry and government data security standards, enterprises, especially SMEs, face difficulties dueto budget constraints. Hence, strict government rules and regulations could be hindering the growth of the global cloud discovery market. Major players in the global market are AlienVault (US), ASG Technologies (US), BMC Software (US), Certero (UK), CipherCloud (US), Cisco Systems (US), Connectwise (US), iQuate (Ireland), Kmicro (US), ManageEngine (US), McAfee (US), Movere (US), Nephos Technologies (UK), NetSkope (US), Nuvalo (US), Perpetuuiti (Singapore), Puppet (US), Qualys (US), ScienceLogic (US), ServiceNow (US), vArmour (US), Virima Technologies (US), WhiteHat Security (US), Ziften (US), and Zscaler (US). 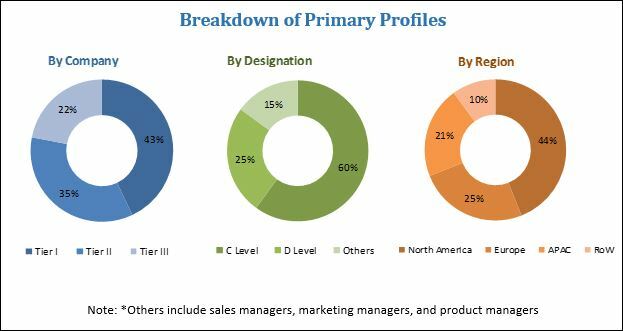 These players have adopted various growth strategies, such as new product developments, mergers and acquisitions, collaborations, and partnerships, to expand their presence in the global cloud discovery market.